Bundesliga | The Americans are coming: Who are Schalke's U.S. duo Haji Wright and Weston McKennie? 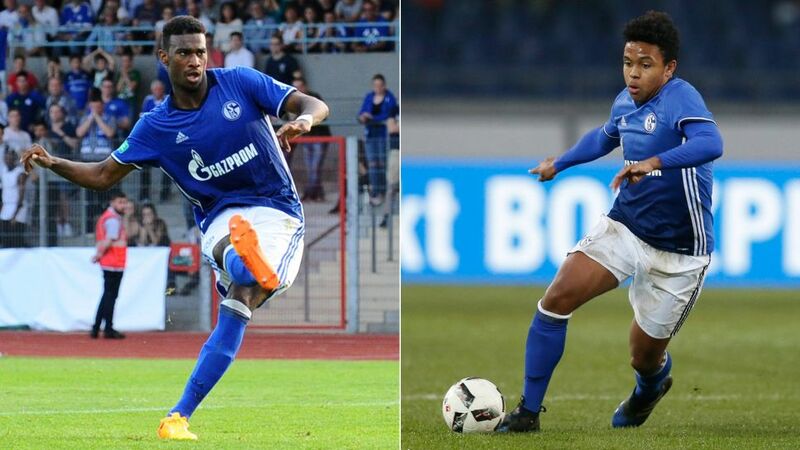 The Americans are coming: Who are Schalke's U.S. duo Haji Wright and Weston McKennie? Haji Wright? Weston McKennie? Not exactly household names, but could they soon be? The U.S. teenagers have recently been promoted to the Schalke first team for the new season, so bundesliga.com runs the rule over the pair of talented Americans, as well as taking a look at some of their compatriots to have flourished on the Bundesliga stage. Considering the recent success of U.S.-born players in the Bundesliga, most notably Christian Pulisic at rivals Borussia Dortmund and Bobby Wood at Hamburg, the Royal Blues may be banking on the addition of a little red, white and blue to spur on a return to upper-table glory and European competition. The day after his 18th birthday in March 2016, Wright made the move to Gelsenkirchen from New York Cosmos, where he played with former Schalke favourite Raul. Whether or not Raul had any influence on Wright’s destination, he certainly made an impression on the teenager. "It’s really helpful training with him and playing games with him," says Wright. "I’ve learned so much in training, little stuff he’s talked to me about: movement, how to hit the ball, so many things. Most players don’t get to play with someone like Raul, so it’s a huge advantage for me." Not quite three weeks after his arrival, Wright made his Royal Blue debut with Schalke’s Under-19 squad, announcing his arrival with a brace in a 3-1 victory over 1. FC Mönchengladbach. One could be forgiven for noting Wright’s 6'3" frame and assuming he’s a typical "target man", but while the Los Angeles native is strong in aerial battles, it’s likely his speed, technical skill, and relative cool in the penalty area that have earned him his arrival to the Bundesliga as a 19-year-old. When Weston McKennie joined his U.S. national youth teammate Wright at Schalke, it was the fulfilment of a lifelong dream. Texas-born McKennie lived in Germany as a young boy when his father was stationed in Kaiserslautern. McKennie got his football start with FC Phönix Ottersbach, a small club located just north of Kaiserslautern. When he was offered a chance to join Schalke, he quickly became convinced that the club famed for its Knappenschmiede academy would provide not only the opportunity to further his footballing career, but return to what he considers the homeland of his chosen sport. "Playing soccer in Europe is like coming to America to play basketball," says McKennie. "You’ve got love soccer in this area because it is soccer!" Like Wright, McKennie played the 2016/17 season with Schalke’s U-19 squad. Featuring primarily as a holding midfielder, McKennie contributed four goals and three assists in 19 league appearances. He even wore the captain’s armband for a handful of matches. When he made his Bundesliga debut as a late substitute in Schalke’s season finale against Ingolstadt, McKennie became the ninth American to play in the Bundesliga this season, establishing a new record. The Bundesliga increasingly is a top destination for some of the United States’ best young talents. Here, we take a look at some of the players to pave the way. In 1992, during an era when there was no opportunity to play top-flight professional football in the United States, Eric Wynalda moved from California to West Germany to became the first U.S.-born player to appear in a Bundesliga match. Thanks in part to his foreign extraction and in part to scoring five goals in his first six matches for Saarbrücken, Wynalda quickly became a celebrity in his new football-mad home, tallying 25 goals in Germany before returning to the United States in 1996. Young Bundesliga fans in the United States these days are likely to know Wynalda less for his Germany exploits than for his current career. Wynalda is a commentator on Fox’s Bundesliga studio show, where he covers the league with fellow Bundesliga alumni Ian Paul Joy (St. Pauli) and Jovan Kirovski (Borussia Dortmund). Born outside Chicago, Illinois and raised in San Diego, California, Cherundolo joined Hannover in 1999 and has seemingly never had eyes for any other club. The man they call 'The Mayor of Hannover' made 302 top-flight appearances for the Lower Saxony outfit, giving him the most Bundesliga appearances of any Hannover player and the most of any U.S. national. The long-time Hannover right-back and captain continues to work at the club as a coach in the youth ranks. Landon Donovan left his Florida academy for Bayer Leverkusen in 1999. Donovan never fully broke through with Leverkusen, nor in his brief loan to Bayern Munich, but there is no question that his development with two of Germany’s most prominent clubs helped launch the most-storied career of any U.S.-born player to date. As the story goes, Borussia Dortmund found Pulisic in January 2014 when they sent scouts to the Aegean Cup in Turkey to scout Wright as a member of the U.S. U-17 team. Two years later, it was Pulisic making his Bundesliga debut against Ingolstadt. In April 2016, in just his third start for BVB, Pulisic got a goal against Hamburg, becoming the youngest non-German player to score in the Bundesliga. Watch: Pulisic: "Americans know who I am!" Nine Americans played in the Bundesliga in 2016/17 – the most ever. The U.S. players contributed a total of 16 goals, with Bobby Wood’s five for Hamburg leading the group for individual glory. With McKennie and Wright ready to join their countrymen and more young players looking to Germany for their footballing future, it would appear that German-American relations in the football realm are in great form. Click here to watch the story of Bundesliga fans making the long journey from North Carlolina to Dortmund.